Picture yourself waking up in a new community. Does your day begin with coffee and breakfast with friends or a swim in the heated indoor saltwater pool? Should you have lunch at the bistro or dine in the formal dining room? To round out your day, do you prefer a walk on the scenic campus trails or an aerobics class in the fitness center? These are just a few of the many options you’ll have for your days and nights when you choose to make Fountaingate Gardens your home. But, before you begin planning an impressive social agenda, you get to decide where you want to live. The first phase of Fountaingate Gardens will include only 176 spacious apartment homes. 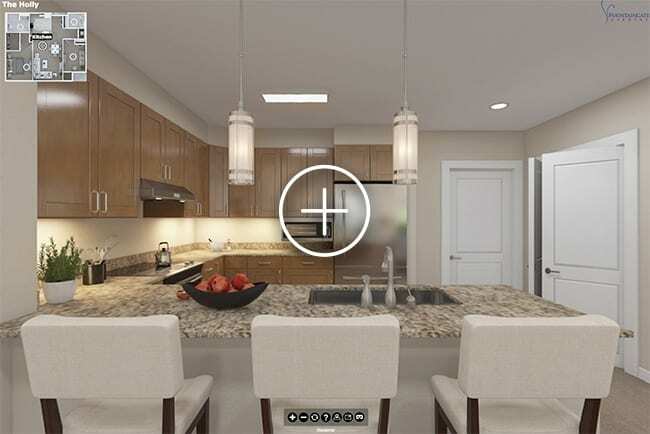 In addition to many spacious two-bedroom floorplans, you’ll also find some charming smaller units that offer exceptional value, including the Holly, a maintenance-free 1 bedroom, 1.5 bathroom residence with a den. See the new virtual tour of the Holly! The Holly offers 1,170 square feet of contemporary living space. A modern kitchen complete with full-size, high-quality appliances connects to a light-filled, open-concept living and dining room. A spacious master bedroom gives you space to read or watch your favorite TV show in bed. An expansive walk-in closet rounds out the space with a functional yet spa-like master bathroom just steps away. A den serves as flex space. Whether it’s an office to compose your great American novel, a craft room to create handmade jewelry or guest quarters to accommodate your family members, you define the space. Ample storage space throughout the apartment home, a washer and dryer, and an opportunity to select your own finishes will check off everything on your wish list. This maintenance-free gem allows you to focus on what’s important – family, friends, and yourself! And, it’s what is just outside your apartment home that makes the Holly such an incredible value. Fountaingate Gardens will offer a state-of-the-art fitness center, an art studio, multiple restaurants, walking paths and trails, a library, meeting rooms, a theater, an all-season swimming pool and much more. And with no home upkeep to drain away your valuable time, these life-enriching amenities will fill your days with meaningful experiences. Retirement life at Fountaingate Gardens will give you an opportunity to try new things, forge friendships and challenge the status quo. And a home like the Holly floor plan allows you to maintain the possessions you value without involving you in the tedious housework. There’s never been a better time to want – and have – it all. Reserve your spot in line by placing a priority deposit at Fountaingate Gardens. Be one of the first to make a commitment to an active, maintenance-free, amenity-rich lifestyle. Modern and convenient living is waiting for you. Whether it’s the Holly floor plan or one of 15 additional designs, let us help you choose the perfect one for you. Call us today at 631-210-5806 for more information.